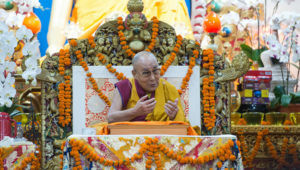 Thekchen Chöling, Dharamsala, HP, India – His Holiness the Dalai Lama’s throne and the pillars of the Tsuglagkhang were decorated with garlands of marigolds today in celebration of his conducting a ceremony to generate the awakening mind of bodhichitta. Once His Holiness had arrived and taken his seat, a small group of laypeople sitting before him recited the ‘Heart of Wisdom Sutra’, for the first time in this temple, in Indonesian. The Sutra was then recited again in graceful English by a single Singaporean nun. “Today is the last day of our teachings on this occasion,” His Holiness declared, “and we’ll be mainly concerned with the bodhichitta ceremony. “The purpose of the Dharma—and of all religious teaching—is to find happiness. Both happiness and unhappiness have their roots in our minds. And just as we need to observe physical hygiene to stay well, we need to understand the workings of the mind and maintain emotional hygiene if we want to be happy. Uphold this precious supreme mind as the heart of their practice. His Holiness remarked that while those who exploit, cheat and bully others are uneasy, the warm-hearted have good health and live in peace. He noted that bodhichitta must be complemented by an understanding of emptiness and that it is important to actually develop them within ourselves. Practice in brief is that. His Holiness repeated that the way to make life meaningful is to develop a warm heart. He observed that when a doctor recommends we relax and take things easy, they don’t mean we should just be physically relaxed—they mean that our minds should be at ease as well. 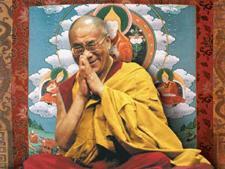 His Holiness then conducted a formal rite for generating the awakening mind of bodhichitta. It was briefly interrupted when a member of the audience had an epileptic seizure. Two physicians attended him and he was soon fully recovered.